Recently, a “Women Against Feminism” webpage has outraged feminists on the internet. On this Tumblr page, young women hold up signs expressing their discomfort with modern feminism. Their critiques vary, but include ideas such as feminism is sexist against men, feminism makes women into victims, feminism does not address other kinds of discrimination, and the patriarchy does not exist. Some feminists have responded to this website with their own satirical messages poking fun at how outrageous they think it is for women to be against feminism. They’ve written articles explaining why the women are wrong to say that feminism creates victims, responded with their own signs defining feminism, and even photographed their feline friends next to signs proclaiming an equal hatred of all humans. But while the snarky comments of "Confused Cats Against Feminism" made me chuckle, I started to wonder if there’s another way to respond to people questioning the validity of feminism. It would be remiss to ignore the fact that feminism itself is what grants women the opportunity to be against feminism—feminists who came before us paved the way for women to be able to speak out about why they don’t need feminism. (Is your head spinning, yet?) While it is easy to just get angry and brush off those with differing opinions—They’re misguided! They’re uninformed! They’re wrong!—I think we could have a much more productive conversation by engaging the Women Against Feminism. Their opinions could teach feminists how to reach larger audiences and dispel some of the persistent myths about feminism. Having real conversations with people who see some issues with the movement could actually benefit the movement as a whole. Many of the women featured on the site expressly mention that they identify as pro-equality, which is a core definition of feminism. Some reflect on the problems with feminism’s association with mainly white, privileged women, and call for a more inclusive movement. If we were to listen to their issues with the feminist movement, maybe we could start to change the stereotype of the bra-burning, men-hating feminist, and build solidarity among those striving to achieve gender equality. 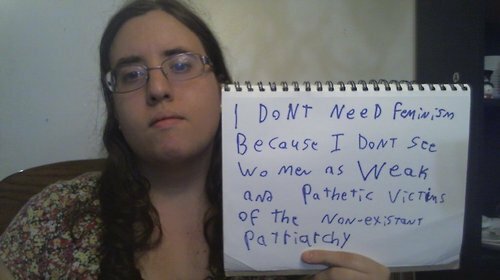 I’d like to talk with the Women Against Feminism and ask why they think that patriarchy is a fiction. I’d like to probe into their opinions about men’s issues and suggest that working for equality of the sexes includes addressing the struggles that men face as well as the ones women face. I’d like to support those women who chose to be stay-at-home mothers and housewives; feminism is all about choice, and I’m happy they had the ability to choose the path that fulfills them. More than anything, I’d like to show these women the feminism that I have experienced: a welcoming movement that empowers me to strive for my own chosen goals and fight for everyone else’s ability to do the same. Perhaps it’s not just the Women Against Feminism who I would engage in this conversation. To break the stereotypes and reach a common understanding of what it means to be a feminist, the conversation could use more voices—women of color, immigrant women, transgender women, women from a variety of religions, and men. Maybe together, we can fight for a world with equal rights for all. Kelsey Martin is a legal intern at Legal Voice and a rising third-year student at the University of Washington School of Law. She has big dreams of single-handedly dismantling the patriarchy through her legal career.